Rory Monserrat has a favorite thing at CANS DELI Oct. 16. “CANS itself is a super cool bar that I like even when there's not a show there,” says comedian Rory Monserrat, explain ing why he chose CANS as the site for his new comedy show and open mic, Favorite Thing. The show features a series of 6-minute stand-up comedy sets, with a band as a backdrop. The band, Whoops, is fronted by comedian Cindell Hanson, and serves as something of a Greek chorus, striking up whenever they’re bored, not enjoying the comedy or have a joke themselves. Long-time professional comedian, agent and promoter Ron Reid offers a beginning stand-up comedy class for ages 50 and up starting Thursday, Oct. 25. The class continues four Thursdays from 2:45 to 4:15 p.m. It’s $90 or free to anyone already enrolled for OLLI’s Spring semester. For details, visit Olli.Arizona.Edu and navigate to the Northwest Campus course catalog offering: Stand Up Comedy 101. 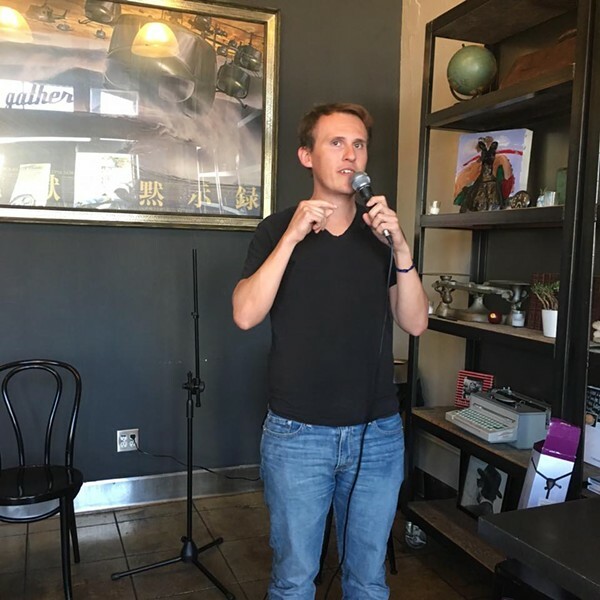 A new non-profit providing education and creating opportunities for Tucson comedians debuts Saturday, October 13, at the grand opening of Hotel McCoy, 720 W. Silverlake Road. The modern vintage motel opens with art, music a charity raffle and dancers as well as comedians representing CAT. The event is free and open to the public.